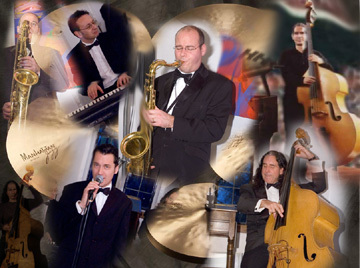 Manhattan Jazz are available from a duo or trio to a nine-piece swing band with vocals. We perform throughout the UK and Europe and can accept bookings anywhere in the world. Our most popular format is as a jazz trio, consisting of saxophone, piano and double bass. Where there is no piano available we provide a keyboard. This trio line-up is excellent for unobtrusive background jazz during cocktails, dinner jazz during a meal and, at smaller events, dancing. It provides an ambience for your event, whilst still allowing your guests to mingle and talk freely. As a four piece we add drums, extending our dynamic range: still highly suitable for background music, but capable of being an all-out swinging dance band. Larger line-ups are available for when you really want a band with impact and we can add male or female vocals to any line up. Our repertoire consists largely of well known 'standards' taken mainly from 'The Great American Songbook': composers such as Cole Porter, George Gershwin, Rogers & Hart, and Irving Berlin, and songs made famous by the likes of Frank Sinatra, Ella Fitzgerald and Billie Holiday and more recently Diana Krall and Michael Bublé. Added to this is a vast array of Bossa Novas from composers such as Antonio Carlos Jobim, and a handful of modern jazz 'classics', such as Watermelon Man, I Wish I Knew (theme from Film 2011) and Take 5. Our funkier side includes tunes by the Average White Band, Spyro Gyra and Herbie Hancock. Led by double bassist Gavin Scott, who studied on a scholarship at the prestigious Berklee College of Music in Boston, Massachusetts, Manhattan Jazz have been providing the atmosphere for parties, weddings and corporate events throughout the UK for over ten years. As individuals they have performed all over the world, for royalty, heads of state, celebrities and film stars, and with many of the great musical artists of our time. If you would prefer to receive a free CD of these and other tracks please enter your name and address in the enquiry form below. Please contact us by telephone, e-mail or by using the form below, to discuss your requirements with no pressure and no obligation. Thank you Gavin. It was great and once again fantastic music. It was a real pleasure to have you guys playing on our event. Everyone really enjoyed it! Just a line to tell you how much we all enjoyed the Trio's playing at our Birthday Jazz Brunch. The music was really lovely and created a very special atmosphere. It was an amazing bonus that you could acompany me with my song, without sheet music and with no notice! My husband was particularly appreciative of the music and said how much it added to his pleasure in the occasion. As I said, my son and I would have danced to all the tunes, if we didn't have to run around and serve food and drink and talk to guests! Thank you again and please thank your fellow musicians. Many many thanks for making our wedding so enjoyable. We had a lovely day and evening made very special by the lovely music that you played. We just wanted to let you know how pleased we were with you and the band on Saturday night. You pitched it just right throughout, and were all an absolute pleasure to deal with. The feedback from our guests is full of praise for you. So thank you very much. Thank you and your band for a wonderful set, our guests enjoyed it immensely as they always do. We've just come back from honeymoon...... We loved your band and we thought you played wonderfully on the night - everyone was very impressed with you and we are really pleased that you played so well. Just a quick note to say what a fantastic time everyone had at David's party last week. All our guests commented on how great the band were, and more importantly David and I thought you were fantastic. Denise in particular received rave reviews. Many thanks to you all for a fabulous evening of wonderful music, we will recommend you to everyone we know. Just wanted to say thanks so much to all of you for being fantastic last Friday. Everyone loved your performance and had a brilliant time. "Saturday night was excellent. All the guest were great jazz fans and Glyn is still on a high. The band and Denise were incredible; a magical night. Guests could not believe musicians of your standard were in my garden!!!. "Even the weather was great. "Just wanted to say a huge thank you to you and the rest of the band for some fantastic music on Saturday -everyone I spoke to said you were excellent and that the passion within the playing was a rare thing to witness!" "We just had to write, to express our enormous gratitude to both you and the band, for helping to make our wedding day one of the greatest days of our lives. "On arrival you were all both professional and friendly, setting up quickly, without any fuss, and immaculately dressed. "From the moment you started playing everyone was drawn to the beautiful sound of jazz filling the room and even though nervous the sound relaxed the both of us, who just wanted to get through the first dance. The first dance arrived in the form of Cheek To Cheek and all our fears drifted away when, as promised you played the tune at a tempo that us two novice Fred Astaire and Ginger Rogers were able to dance to. After this everyone joined in, dancing to familiar tunes, some singing along (not always in tune and sometimes with their own lyrics), having a thoroughly good time, moving my niece who is only 8 to say to me that she thought you were really cool. "The thing that really made it for us was that you guys seemed to be having a really good time as well. "The next day we received nothing but compliments, from both our guests and from the hotel and their staff regarding you and the band, with the highest accolade being that you were the best band that had ever played at The Waterside Inn. The hotel has commented that you will now be recommended to everyone wishing to hire a band to perform there. "We would just lastly like to say good luck to you and the guys in the future and that we will have no problem recommending you to anyone looking to hire a great band. "You guys were loved by all that came, and were a refreshing change to the normal Wedding DJ...."
"We had a brilliant time and everyone has been commenting on you, so just wanted to pass ours and their thanks to you and your band." "My friend Nicki is over from England for a few weeks and we have been reminiscing about the party. I have had lots of messages from people saying how much they enjoyed it, especially the music! Thanks again for making it such a special day." "Thank you again for coming up to Birmingham and playing at our wedding, the music you chose and played was perfect for the type of celebration we wanted. Please could you also pass on our regards and thanks to the rest of the band."